The yellow-footed green pigeon (Treron phoenicopterus), also known as yellow legged green pigeon, belongs to the family Columbidae. 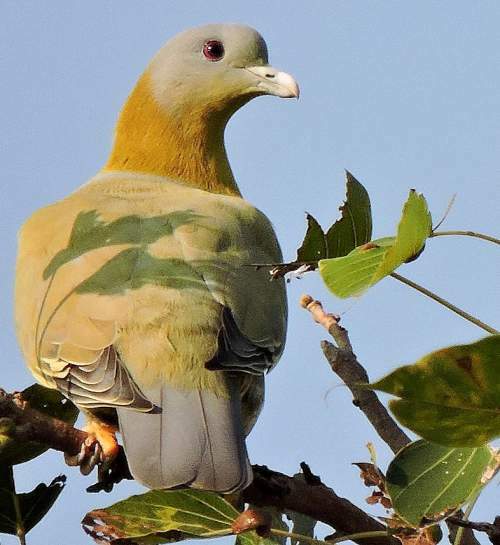 The green pigeon species is distributed in Indian subcontinent, southeast Asia and China. This green pigeon is the state bird of Maharashtra (India). These pigeons are polytypic species. The yellow-footed green pigeon (Treron phoenicopterus) is a medium-sized green pigeon, measuring 31 to 35 cm in length and weighing 200 to 250 grams. These yellow-footed green pigeon species have bluish gray crown, nape and cheeks. The throat and the breast are pale yellowish orange. The underparts are paler. The neck is yellowish mustard. The upperparts are grayish green. The bill is creamy white and the tip of the upper mandible is curved. The irises are reddish brown. The legs and feet are yellowish. The call of these green pigeon species is a mellow whistling "kwa.kow" sound. The yellow-footed green pigeons are distributed in Pakistan, India, Sri Lanka, Nepal, Bhutan, Bangladesh, Myanmar, Thailand, Cambodia, Laos, Vietnam and China. In India, these yellow-footed green pigeon species are distributed in all the states, except for the Lakshadweep Islands and the Andaman and Nicobar Islands. The yellow-footed green pigeon nominate subspecies T. p. phoenicopterus is distributed in Himalayan foothills in India, Gangetic plain, Nepal, Bhutan, Bangladesh and northeast India. The subspecies T. p. phillipsi is distributed in Sri Lanka. The yellow-footed green pigeon subspecies T. p. chlorigaster is distributed in eastern Pakistan, central India south of the Gangetic plains and southern India. 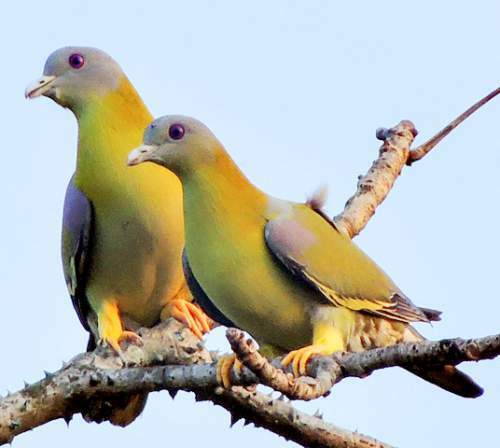 The green pigeon subspecies T. p. annamensis is distributed in Cambodia, Laos, Vietnam and eastern Thailand. The subspecies T. p. viridifrons is distributed in Myanmar, China (southern Yunnan) and northwest Thailand. The Important Bird and Biodiversity Areas (IBA) of these yellow-footed green pigeons in Laos are Attapu Plain, Xe Kong Plains, Dong Khanthung and Dong Kalo. The IBA in Cambodia are Upper Srepok Catchment and Chhep. These yellow-footed green pigeon species have moderate forest dependence. They normally occur in altitudes from 0 to 1000 meters. The artificial ecosystems and habitats of these species include heavily degraded forests, rural gardens and urban areas. The natural ecosystems and habitats of these species include tropical and subtropical moist lowland forests, foothill forests, tropical and subtropical moist montane forests, scrublands and dry shrublands. The diet of this yellow-footed green pigeon consists mainly of fruits. Wild fruits, orchard fruits, drupes, berries and figs are their primary food. These green pigeons forage on the branches of fruit trees. The breeding season of these yellow-footed green pigeons is during March and April in India. The laying season is from March to June in Bangladesh. These species are monogamous and territorial. 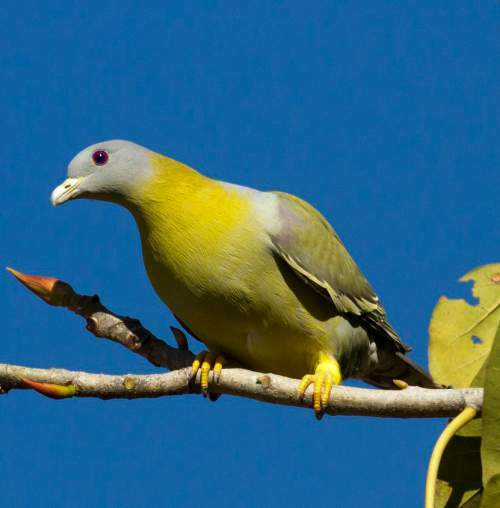 The yellow-footed green pigeon nesting sites include shrubs and fork of the tree branches. The nest is a flimsy platform of sticks, twigs, grass and leaves. The typical clutch contains two white eggs. The chicks of the yellow-footed green pigeon are altricial and require considerable parental care. Initially the chicks are fed by parents with crop milk, a regurgitated secretion from the lining of the crop. These yellow-footed green pigeon species are non-migratory resident birds. They disperse locally after breeding. The populations in higher altitudes descend to the lower levels during winter. The global population size of the yellow-footed green pigeon (Treron phoenicopterus) has not been quantified. The overall population trend of the species is considered to be increasing. In most of its range, this green pigeon species is reported to be common and widespread. The generation length is 4.2 years. Its distribution size is about 8,970,000 sq.km. Breeding habitat alteration and destruction, hunting for food and capture of adults and juveniles for pet-trade are the main threats that are endangering the survival of these species. The yellow-footed green pigeon (Treron phoenicopterus) does not approach the thresholds for being Vulnerable, either under the range size criterion, or under the population trend criterion or under the population size criterion. The CITES (Convention on International Trade in Endangered Species of Wild Fauna and Flora) status is ‘Not Evaluated’ for the yellow-footed green pigeon (Treron phoenicopterus). The yellow-footed green pigeon (Treron phoenicopterus) is closely related to Bruce's green pigeon (Treron waalia). Current topic in : Yellow-footed green pigeon - Treron phoenicopterus.